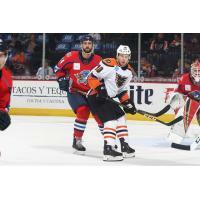 Lehigh Valley, PA - The Lehigh Valley Phantoms scored on four different breakaways accounting for half of the team's offense en route to a big night in an 8-2 rout of the Springfield Thunderbirds on Friday at PPL Center. Greg Carey (6th, 7th) and Taylor Leier (1st, 2nd) had multi-goal games while Chris Conner (4th) registered a goal and two assists. Mike Vecchione (4th), German Rubtsov (6th) and Cole Bardreau (3rd) also lit the lamp. Bardreau's breakaway marker was his second shorthanded tally of the season, both against Springfield. Chris Conner collected his 300th career AHL assist on the first of his three points in the game. 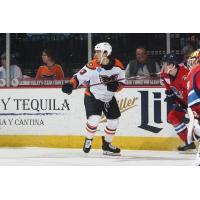 And Leier's first two goals of the season came in his 200th game all-time with Lehigh Valley. Leier joins Conner as the only two players to have reached the 200-Game milestone with Lehigh Valley. Lehigh Valley's six-goal margin of victory also equaled an all-time team best accomplished three other times since the Phantoms arrived to Allentown, most recently in the 8-2 win at Springfield last February. Then it was Mike Vecchione's turn on the breakaway going to the upper right corner at 7:36 with Conner again assisting for a four-on-four goal. Exactly one minute later it was Cole Bardreau burying his shorthanded breakaway for a 4-1 lead less than nine minutes into the middle frame. Both of Bardreau's shorthanded goals this season have come against Springfield. This one was unassisted. After Dryden Hunt sniped off the post for a Springfield goal at 13:03 it would be German Rubtsov to score the record-breaking goal at 16:23 of the period. T.J. Brennan's slapper handcuffed the goalie, Michael Hutchinson, thus allowing Rubtsov to muscle his way through and nudge the puck barely across the goal-line marking the first time ever that Lehigh Valley had scored five goals in a period. Greg Carey slammed home a 5-on-3 conversion early in the third period for his second marker of the game. And David Kase's intercept on the blue-line created a two-on-one and ultimately set up Leier all alone on net on practically a mini-breakaway. Leier this time went wide around relief goaltender Samuel Montembeault for a forehand goal wide of the netminder's right skate. Then it was Misha Vorobyev's stretch-pass perfectly connecting with Conner in stride for yet another breakaway conversion, this time five-hole on Montembeault, to complete the scoring with 5:31 remaining. 1st Period-1, Springfield, Thompson 7 (Zolnierczyk, MacDonald), 17:46. Penalties-served by Zolnierczyk Spr (bench minor - delay of game (faceoff violation)), 5:22. 3rd Period-8, Lehigh Valley, Carey 7 (Varone, Myers), 5:43 (PP). 9, Lehigh Valley, Leier 2 (Kase), 9:49. 10, Lehigh Valley, Conner 5 (Vorobyev, Willcox), 14:29. Penalties-Bardreau Lv (high-sticking), 0:53; Byron Spr (slashing), 3:47; McCoshen Spr (delay of game), 3:59; Thompson Spr (roughing), 6:57; Brennan Lv (hooking), 8:09; Hunt Spr (hooking), 9:11; Schemitsch Spr (misconduct - unsportsmanlike conduct), 12:22; Bardreau Lv (misconduct - unsportsmanlike conduct), 12:22.